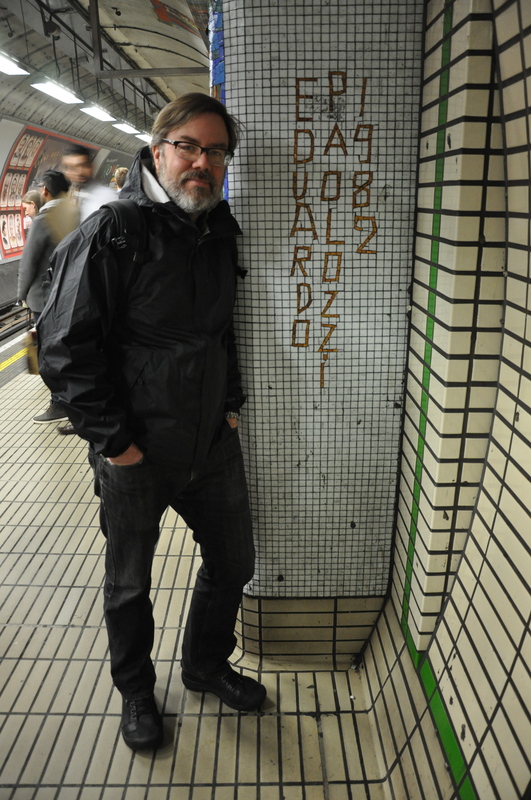 Michael Oatman in London in March 2014 with Eduardo Paolozzi’s 1982 mural for the Tottenham Court Underground Station, completed the year he started college at RISD. Photo credit: Jen Kollar. Michael Oatman is brilliant. He calls his practice “the poetic interpretation of documents,” and much like a poet in love with the lyric moment, he captures hundreds of still-lifes, bits of magic, preserving the quality of the painterly images he works with by using them in his constructions, simultaneously reverent and irreverent. 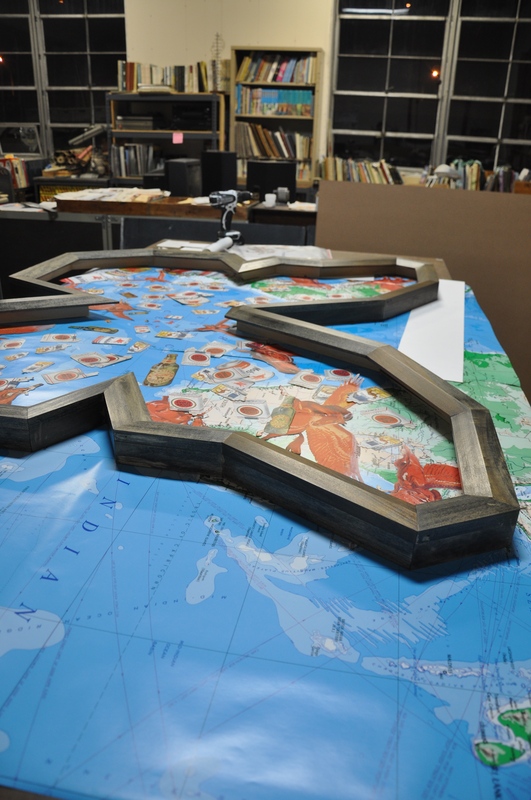 He works in collage and installation, making pieces that can be extremely large scale. His work, studio, and intellect set up a seduction not unlike a labyrinth, and shortly after entering, you realize you’ve willingly let go the thread. Time no longer exists. You want to go down every rabbit hole. His downtown Troy studio is jam-packed, floor to ceiling. Yet it is also highly organized and makes your fingers itch with excitement and curiosity. There are books everywhere. Thousands. And objects, in stacked files and bins overflowing, whose stories and histories are locked away, subject to the imagination, some known only to their collector. Oatman unlocks or reinvents these images and objects for us as painstakingly as a surgeon. Oatman’s influences, surprisingly (and not) include Cage, Duchamp, and Hitchcock. His installations are utterly immersive projects, and he’s constantly got things in the works. Many of you will have seen one of his recent pieces, a four-year collaborative effort, “All Utopias Fell,” installed at Mass MoCA. It includes jars of tomatoes his mother canned, a stationary exercise bike from the seventies, power tools, a record turntable and collection of vinyl records, and a fascination of knobs, gizmos & do-dads, which remake odd instrument panels. Of course there are books, among hundreds of other items, housed in a re-purposed Airstream trailer, whose outside is graffitied with phrases including “Ignore alien orders,” “One word changes everything,” and “Build your wings on the way down.” This trailer has become a spaceship, a satellite that has crash-landed, and the collection inside & out tells the story of a man. We get the feeling that Oatman’s work is suffused with his biography. Because he is so deeply engaged in the world around him and in art as a means of communication, I was inspired to speak with him primarily about collaboration and connection. Mary Kathryn Jablonski (MKJ): Michael, I see here in your studio that you’re working on a new collage using images of cloaked body parts. They remind me of Nina Katchadourian’s “Lavatory Self-Portraits in the Flemish Style,” and make me want to ask you, what would you do if you were trapped on an airplane for twenty hours? Michael Oatman (MO): I’ve had that happen before. 38 hours one time to go to Montana, and it only took me 27 hours to go to Easter Island, the most remote place in the world. I’ve been in that kind of situation. I’d probably get everyone on board to do something together to kill time, because everyone’s got a video camera on their phone. Also, what I used to do a lot of when I was waiting, when I didn’t have a car, when I was a student, I had my sketch book, and I’d just draw. Everybody. Bus stations, train stations, airports, waiting to get on the subway. And I find when I travel I sometimes go back to that a little bit. I like drawing people. For me, it’s not part of my work any more, but occasionally I’ll draw the figure. I taught it for 10 years, but the kind of drawings you get out in the world are really different from the kind of drawings you get of the body in the studio. Sometimes a body makes a scene seem more real somehow. I don’t live in a sketchbook quite as much as I used to, but I think Nina’s really figured out something hilarious. MKJ: Yes, I especially love the clandestine “Bucklehead” photos of other passengers reflected in her seatbelt. MO: Oh, that’s great. Yeah, I just saw the movie, Finding Vivian Maier. It’s about a woman who was a self-taught photographer who produced over 100,000 images in her lifetime. Quintessential street photographer, easily as good as Robert Frank. She was a nanny to make her money, but she also wanted a job that wouldn’t take up a ton of her time, that would get her out onto the streets all day, so she worked for seemingly dozens of families from something like the 1940’s until the 90’s, maybe longer. 50, 60 years as a nanny. Sometimes you can tell she had a Rolleiflex that you looked down through the top of. It was easy for her to take pictures with no one noticing her. But other times it’s clear that the subjects are looking right at her. She had the ability to get people to trust her enough to take that photo. It’s a wonderful movie. But going back to the visual relationship to Nina’s things. What I obviously like about those photos where she mimics the Dutch Masters… These photos I’m currently working with are actual pieces of diseased skin that the doctors or authors of the book (titled “The Jacobi Dermachromes”) framed out with cloth to look a bit like relics. They’re kind of honoring the disease and the person by beatifying it, and that’s what I really like. I did some work many years ago with images from life saving manuals, and in all these scenes of mayhem with broken legs and bones sticking through arms and people unconscious and bleeding, everybody, including the victims, looked so calm. And that was something I drew on. 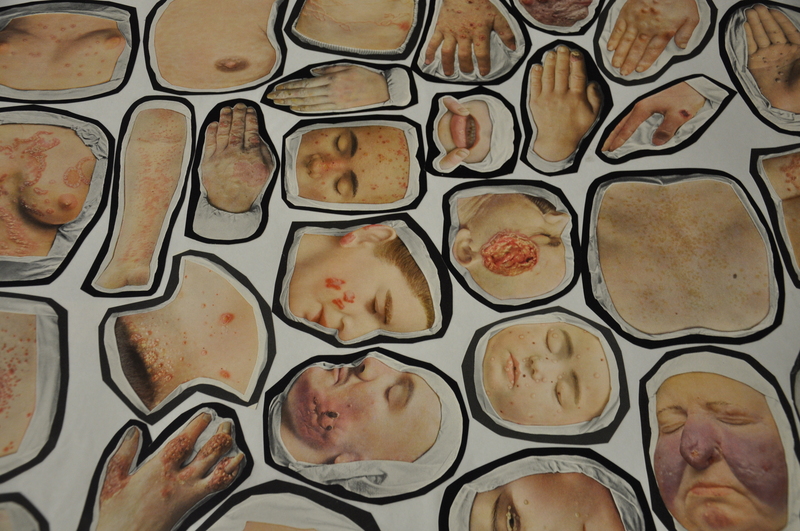 Similarly, what I like about these diseased skin images is the devotional quality, and that is actually how I think about the images I use in my collages. Generally speaking, the pictures that I’m using, nobody cares about anymore, because everything on the Internet is a photograph. Why have a painting of a sea urchin or a horseshoe crab when you can have a photo of it? The illustrators that I use whose work comes mostly from between the 1920s and 70s made everything by hand, by painting. I guess it’s a little nod to the fact that I used to be a painter, so I really like images that started as paintings and ended as reproductions in books. With this project, in breaking my own rule, I’m working with photographs, but I feel like they’re altered enough by the process of being framed out with the fabric around the figures, and the hand coloration, and the separations for printing, that they feel more like illustrations to me than straight photographs. Because there are often hundreds of illustrators in one image that I make, and it has to work somehow, I’m trying to maintain the “official quality” of these original picture sources, which were so authoritarian, and at the same time, confidence in the judgment of the selector. MKJ: Your work seems at once nostalgic and futuristic. In that way it reminds me of some of Margaret Atwood’s novels, The Handmaids Tale, Oryx and Crake. And all of your work, whether the two-dimensional wall pieces or the three-dimensional installations, I see as collage. And I have these new frames that my dad has been making, which nobody’s written about yet. It’s really interesting for me because I’ve always commissioned my folks to make work for my projects, so I’ll hire my mom to do sewing or my dad to do carving or knife making or frame making and I’ll ask for 10 frames, as I did recently for this piece called “The Branch,” which is 30 feet long, which Ian Berry commissioned for the Wellin Museum of Art at Hamilton College. My dad made these rectangular frames that I kind of assembled together on the wall in the form of a branch. But two Thanksgivings ago he called me excitedly to ask if I was coming home for the holiday, saying he had this idea he wanted to run by me, an art idea he didn’t think anyone had done before. So I went up to Vermont and he had this beautiful drawing on vellum, a drafting of a Native American thunderbird shape. And he said, “I’ll make these shapes and you fill them.” I’ve been waiting for this for 30 years, for him to propose a project. Because it’s always been, “Dad, I need this. It’s this dimension. Here’s how to make it.” Now he’s picking the shapes: fish, butterfly, bat, thunderbird, anvil. I guess I influenced him on the anvil [see bio: Falling Anvil Studios]. He just gets them done whenever he gets them done and delivers them, and he’s an amazing resource. But it’s a real challenge, because the way that I’ve been working with imagery is in the classical manner of the Renaissance model: single viewer, a scene that unfolds in the world. I generally don’t make pieces that are pure abstraction, although I’ve made a few. One was in a Tang show and called “Code of Arms,” which was a human DNA helix. It’s pretty abstract, but it was still made out of pictures of things. Or a piece I made titled “Germinal Velocity.” Having the shaped edge means that you’ve really got to work with it or ignore it in a fantastic way. It’s been an opportunity for me to think dynamically about what’s been going on. It’s also given me an opportunity to change scale. “Germinal Velocity (by the time I get to Phoenix, she’ll be rising),” 2013, collage on paper with frame custom made by the artist’s father, Gordon Oatman. Like in this new piece, it’s not a landscape in a traditional sense, the zoom-out of the surface of the earth, but when I began to move the butterfly frame around, I realized that Africa fit in the upper right hand corner and the rest of it was blank. It’s a piece kind of about the butterfly effect, you know, the butterfly flapping its wings in the Amazon, changing the weather, and this is more like a creature of human invention, the Pegasus, which is the Mobil Oil Corporation mascot. I’ve been collecting them. So they’re kind of the storm spiraling out. The working title for this piece is, “Convenience Storm,” a play on convenience store, which is a place where you get things like gasoline, cigarettes, condoms, beer. This piece is a bit about convenience store culture, a weird “Ode to Stewarts,” our regional shop, and I’m sure I’d be shocked if I learned how much I spent at Stewarts over the years. This piece is still very much in progress, and I’m not sure where it’s headed. I think things started to snap when I got the red working with the rest of the colors in the map. This is going to be one of the pieces in my upcoming show in October at the Arts Center in Troy with Colin Boyd called “Abecedarius,” which, as you know, follows a kind of A, B, C format. We’re each taking 13 letters of the alphabet and making a work, and we’re going to do one ampersand work that we make together. 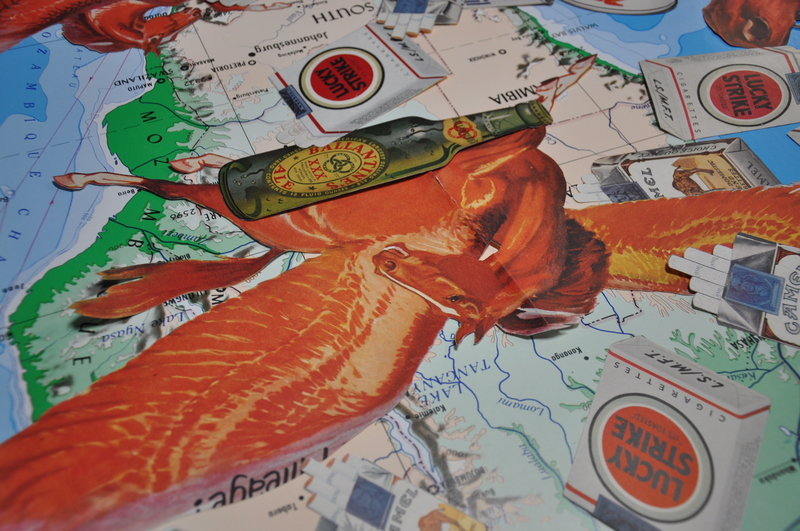 “Convenience Storm,” 2014, collage on map with frame custom made by the artist’s father, Gordon Oatman. Process, studio view. Detail view of “Convenience Storm,” 2014, in process. MKJ: Has it ever felt forced to you to have your father make the frames first and you having the task of filling them? Have you ever dreaded the challenge or has it thrilled you instead? MO: Totally thrilling. And what’s really thrilling is his process. He finds a shape online, so my non-computer-expert Dad has been surfing Google looking for animals. He’s thrown a lot of things out there that we’ve decided weren’t so great. We thought a manta ray was good, but he couldn’t really find a geometry that he liked. He thought a shark might be interesting, but it was a little too goofy. And then he found this bat, and it got stylized, not quite like the Batman logo, but it’s very baroque. I asked him years ago to find a way not to cast a shadow as much with the frames, and he came up with this bevel on the surface, which tapers down to about a quarter of an inch. Previously it was a three quarter inch edge. I asked him to start making frames like this when I came back from the Rijksmuseum in Amsterdam and saw these really plain frames around Dutch paintings. I’d been teaching that semester in Rome and took a trip to Amsterdam to meet my then wife. In Rome the frames were like somebody threw up on them and then gold-leafed it, but in Northern climes they wanted this severe Calvinistic frame. So that’s what my father and I started doing, and we just painted them black instead of the Jacobean brown, which he was using earlier. His process includes finding an image and printing it out at home. He goes to an old fashioned Xerox place, blows it up, then uses his 30-60-90 triangles, protractors, and other tools, as he averages the geometry. I think you have to admit that it’s a very good configuration of that shape, and I hope to actually show these drawings that he made someday, because I love them: the graininess of the Xerox and the calculations of the angles written at each point. I think this frame has 32 compound angles. Not only is he beveling the surface, he’s mitering each angle, you know, it’s 25 degrees, 60, 15, 45, 30, 60. It’s a lot of work to make these frames! So I really appreciate it, and I’m glad we’re finally getting to do something that’s a real 50-50 team effort. I’d long hoped to do a project with my whole family, my brother included. He’s in finance, but he was great at sewing when he was younger. I want to do an “Oatman Family Robinson” type show, where they would make everything. We would make everything together. That may happen someday. MKJ: I made the assumption that when you work in the studio on your 2-D collage works it is a very solitary, meditative practice, based on the exacting quality of your cutwork. 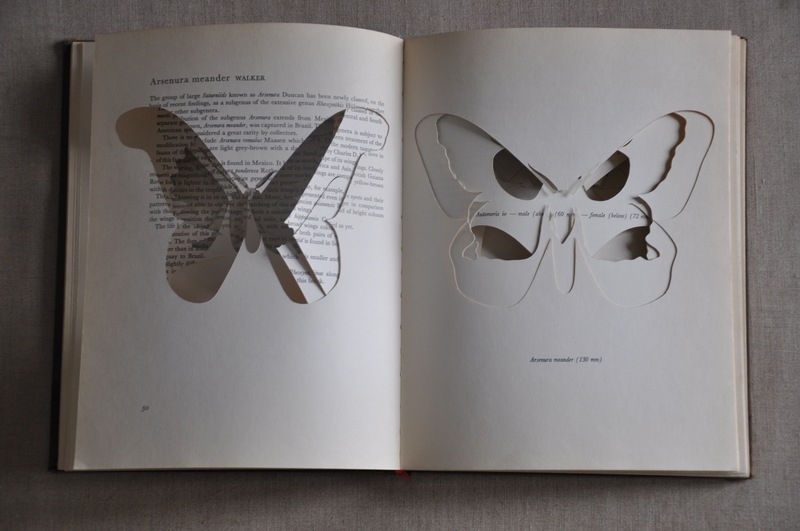 In the project “Beautiful Moths,” even the book you cut is intact! At Mass MoCA, however, the wall label for “All Utopias Fell” reveals an amazing collaboration of over 20 names. I recall thinking that the canned tomatoes in that installation must have been your mother’s. I was going to ask you to speak about the differences between the (seeming) privacy of your studio practice and the social, collaborative aspects of your installation works, yet you’ve just been describing the blurred lines between the two, haven’t you? MO: There were way more than 20 involved in the Mass MoCA piece; like maybe 60. And, yup, Dad grew the tomatoes; Mom canned them! Well, if my dad continues to make these shaped frames for me I’d be happy to work in nothing but the shapes, although I do have a lot of projects that are earmarked already for rectangular frames. It’s a really good question. I used to do the installations completely by myself and then my ambitions got bigger and museums wanted bigger pieces, and I had longer time frames within which to work. Now, I’d probably say that I wouldn’t do installations without working with a lot of people because I like it. I get to be like a director on a film. When you work with a lot of people you have to have a certain control over the overall project, and I think you also let go of a lot. And that’s much more surprising for me. There’s much more of a chance element if you say to a student, “All right, if you want to make a video for this piece, make a proposal and we’ll include it in the reel.” If I’m asking a helper use beer labels to make them into a kind of wallpaper in the ship, and they get to determine what the layout is, then I get to be surprised by that. My longtime editor that I worked with for many years is a former student. He’s now editing out in Hollywood. He began to know what I was interested in after awhile, so he could do a lot of work on his own that would be in the vein of how we’d work together. I miss that relationship greatly, and I’m looking to rekindle or replace that, working with a new editor. But I think collaboration is interesting not just because of the high, but also because of the surprise. That’s why I do it now. I’m currently working on a big project for Toronto with my friend Brian Kane, an artist from Cambridge, Massachusetts, curated by Denise Markonish from Mass MoCA, titled “Nuit Blanche.” It has changed, because of venue changes and budget changes, literally a dozen times. It’s been super-interesting, and I think we’re going to have a great project in the end. We’re also collaborating with Paul De Jong, the cellist and former member of the now disbanded group The Books. He’s an amazing composer, studio craftsman, and performer. This sort of “secret” project is being deployed at Union Station for 12 hours only, at a sunset to sunrise art festival, on October 4th. It’s deeply collaborative, curatorially, and even in terms of working with the city managers. It has had its challenges and its delights, and I think that’s the nature of collaboration. I don’t know of any collaborations that were completely smooth. I think they’d probably not be so interesting. MKJ: I want to know if you conceal yourself in your works, particularly your collaborations, or if you reveal yourself. Of course, most viewers who walk into the Airstream at Mass MoCA must ask if Michael Oatman is the hermit. MO: When I was an undergraduate student I was churning out a lot of stuff. After I was a freshman and chose my major, which was painting, I was making a lot of collages, and I think it was my friend Todd Bartel who pointed out to me one day that every single image that I’d been making had a hand in it somewhere. Sort of, the Hand of God, or maybe the Hand of the Maker. It was a symbol that had crept in, and hands were in sculptures and pointing down from the sky and jutting into frames. Ninety-five percent of what I made that year in prints and collages and paintings had no full bodies, not even heads or faces, but hands coming into the frame. And once I saw it, I began to do it in earnest to try to figure it out. I guess I began to see it as a reluctant portrait in a way, but also mentors, parents, and partners, an absent body. Later, when I was making paintings in graduate school that were all about bodies, they were very distanced. Even later still, I used imagery of objects used by the body, the tools of a surgeon or artist. If there was a body in the picture, it was often an unconscious body or disembodied body. Lately I’ve been thinking about the great tiny piece by Rauschenberg called “Portrait of Iris Clert.” I think the story is that he was supposed to be in a portraiture show featuring this woman in particular, and he telegrams the gallery, addressing Iris Clert and saying basically, “This is a portrait of Iris Clert if I say so / Robert Rauschenberg.” Her name was in it. His name was in it. Her picture was nowhere to be found, and it was just this completely conceptual move. Remembering that piece has been useful in answering this question. I do get asked a lot where I am in “All Utopias Fell.” I think that the short answer is that my biography drives a lot of the material and image choices. Not any readily available facts about me, not my own image, obviously. It’s really how sensations, stories, memories from my own life help me make choices for what’s going to go into a piece, and that’s beautifully indirect. That piece at Mass MoCA on some level is about a romantic relationship that ended, on some level it’s about historical figures that have influenced me. In the stained glass there are references to Tom Phillips, author of The Humument, my girlfriend in college, and my mentor, Alfred DeCredico, both of whom are now gone. There’s also reference to Chinua Achebe, author of When Things Fall Apart, who was alive when I made the window, but recently died. His book is also in the installation. You know, it’s riddled, riddled, with personal information that is not easily obtainable by the viewer, because I don’t think it needs to be, but it needs to be there for me to make a choice about something. For me it isn’t every work that’s deeply autobiographical, but the large ones tend to be. I’ve made something like 24 installations in my lifetime now, some big, some small. MKJ: “All Utopias Fell” is actually a project in three interrelated parts: “The Shining,” “The Library of the Sun,” and “Codex Solis.” Let’s talk about the solar panels/coded text aspect, titled “Codex Solis.” I recently attended a wonderful panel talk at the Arts Center in Troy on The Creative Process, and among other things the discussion touched upon topics including success & failure, submission & rejection of works, and intrinsic value of the work as well as public recognition. So often you speak about art as a form of communication; would this piece be a “failure” in your mind if it were never deciphered? Or, if it is deciphered and publicized, does that devalue the piece in your mind? Or, is its value intrinsic, making these issues irrelevant? How do you process this piece? MO: If it’s solved is it a success? If it’s not solved is it a failure? Or if it’s solved is it a failure? If it’s not solved is it a success? Actually, one person has solved it. The analogy for “Codex Solis” for me is a Duchamp piece called “With Hidden Noise,” which I think is one of his greatest contributions to the idea of art. It is two plates of metal with a ball of twine in between, and there’s some French and English words on the top and bottom of it, and right before he closes up the two metal plates with four bolts, he gives it to his friend and patron Walter Arensberg, and tells him, “Put something inside and don’t tell me what it is.” That’s what Arensberg does, and supposedly nobody’s ever opened it. It’s highly unlikely in the world of curious people and conservators that nobody’s X-rayed the thing. People have speculated that, well, Arensberg wasn’t a particularly risky guy intellectually, and probably knowing Duchamp’s interest in chance, there’s a die or coin or something related to chance hidden in there. They’re good guesses. They may be totally off base. Hopefully we’ll never know. In my mind, that’s the perfect artwork: where the artist makes something extremely deliberate, and there’s a great deal about it that he doesn’t know. That’s what I want to do. In “Codex Solis” I still know what the message is. I had to look for it in a very unorthodox way. It had to be a certain number of characters. I could have as many mirrors and blank spaces as I wanted, but I had to have a certain number of solar panels. It took me six months to find something that would meet the electrical load of the piece, which is a weird requirement, kind of Duchampian. And I needed something that would relate content-wise to my overall project. It’s not something that I wrote. It’s something that I transplanted into the piece. Now, would it have been a better piece if someone else chose the text? Probably, on some level, because then I wouldn’t know what it is, sort of invisibly beaming into the heavens every day. I think that the person who solved it generously decided to keep it to himself, because to answer your question, something will change when it is revealed. I think it will be interesting for people, some more than others, to know what it says. MKJ: Yes, yes. Toshiko Takeazu also made closed ceramic vessels, inscribing the inner walls with hidden messages before she sealed and fired them. One final question, Michael. Does your artwork ever teach you things about yourself? “Who, Me?” (from the ongoing series “Pornithology”), 2014, collage on paper, 10″ x 13″. MO: All these books to look through… It can be wildly inefficient, because I stop to read. I cut things out and leave them in a pile and forget about them and come back to them, and don’t quite remember what they were for specifically, but they take on a new meaning, and that’s a sort of gift of working with physical material. 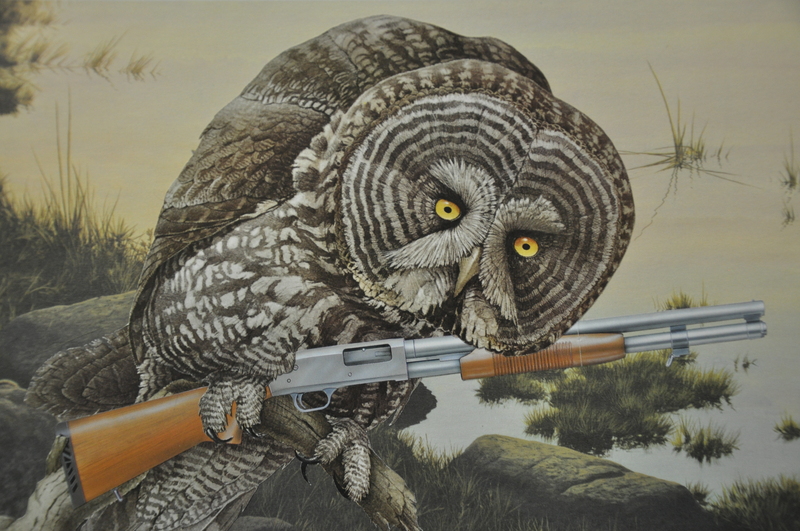 There are a few in this folder titled “Pornithology,” birds and guns and things I think of as a perversion of the birds through human weapons. But I also make deliberate notes and sketches. Almost every collage or installation has anywhere from a few to hundreds of drawings. Then there’s like a rule that comes along. Like the Moth Book Rule of removing only shaped things. For instance I wouldn’t bother to remove rectangles from the dictionary, but if it’s a book of birds and they’re in that shape, then that’s a much more interesting book to cut out. Otherwise, I would never tear a book apart, but I’m choosing books that are beautifully laid out, and there’s an acknowledgement that the designer, the illustrator were masterful. I think that the studio is a place of great discovery. I don’t even know if I’d call it learning as much as I’d call it discovery. It’s not knowledge in the way that I’m consuming it. It’s trivia. I would say that there’s loads of interesting trivial information, lots of experience that happens in the studio. I don’t think I’d do it if there weren’t some sort of payoff of consciousness or realization or growth. Certainly the studio has been a very sustaining part of my life. The first thing that saved me was probably reading. The second thing that saved me was an outlet for ideas. But the studio is always like an old friend. There’s second hand smoke knowledge in the studio all the time. But I learn a lot more in the collaborative works, from other people, students, teachers, friends, audience members, people who start out as audience members and become collaborators. They’ve seen something and they get in touch with me and want to become involved. I try to think, if there’s a place for them that would be great. It’s an easy decision to make, because help is help and it’s going to change the piece. It’s going to change the way I think about it. Michael Oatman was born in Burlington Vermont in 1964. He received his BFA in painting from RISD in 1986. His installations integrate thousands of found, modified and handmade components, including artifacts of material culture, painting, drawing, video, sound, food – and objects at the scale of architecture. These ‘unvironments’ have been installed at museums, public spaces and private homes. 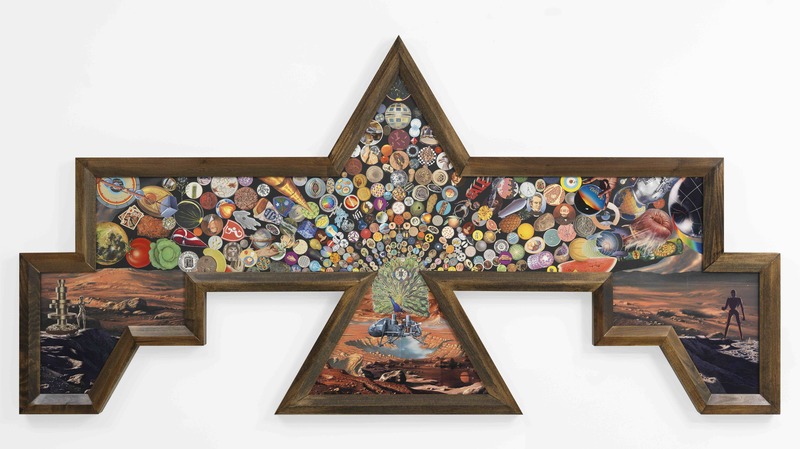 His collages, also realized on a large-scale, typically contain vast numbers of hand-cut images culled from discarded and unloved books – children’s encyclopedias, scientific texts, product and armament catalogs. His father, a carpenter, makes the frames. His rigorously researched subjects include genetics and eugenics, capital punishment and prisons, the history of knowledge and the exploration of space. Often using large amounts of material from archives, libraries, flea markets, garage sales, abandoned stores and the collections of private individuals, he refers to his practice as ‘the poetic interpretation of documents.’ He has also written about art and has curated several important exhibitions, most notably Factory Direct, a new version of which was mounted by the Andy Warhol Museum in 2012. Similar to the Situationists’ notion of the dérive, his works often begin with an aimless foray into psychogeographic terrains, on foot, in a car, or occasionally by dreaming. In order to perform his research he has posed as a salesman, pollster and journalist; sometimes this playacting gives way to legitimately operating as a private detective, technician or personal assistant. In addition to his studio and post-studio practices, Oatman teaches first-year and thesis in the School of Architecture at Renssealer, in Troy, NY. His Extreme Drawing course – as well as seminars on Duchamp and Hitchcock – are popular, even with students from non-art disciplines. He has also taught at Harvard, The University of Vermont, SUNY Albany, St. Michael’s College and Vermont College. He has been a visiting critic at RISD since 1986. Oatman’s installations are ‘context-specific,’ and demand from him a total immersion into physical location, sonic/haptic realms, local history and the personal stories of those he encounters in the process of making a work. He is prone to collaboration, and, since 2004 has worked with gifted students under the name of Falling Anvil Studios. Privileged to study with Kate Ericson and Mel Ziegler, the most significant conceptualists/social activists of the 1980s/90s, he has also studied with Ana Mendieta, Guillermo Gómez-Peña, Edward Mayer, Jim Dine, and his RISD mentor, Alfred DeCredico. Oatman has shown his work extensively in the U.S. and abroad. Recent projects include All Utopias Fell, a permanent commission for MASS MoCA, which opened in October 2010; a large-scale commissioned collage for the newly opened Wellin Museum at Hamilton College; a recent book for graphic design firm id 29, and a long-term outdoor video environment. He is represented by Miller/Yezerski in Boston, MA; Lenore Grey in Providence, RI; Stremmel Gallery, in Reno NV; and Mayson Gallery in New York, NY. 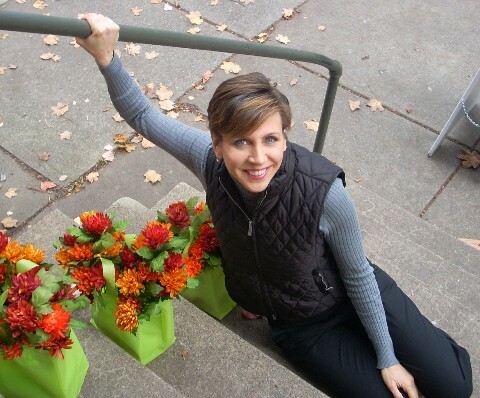 Mary Kathryn Jablonski is a gallerist in Saratoga Springs, a visual artist and a poet, author of the chapbook To the Husband I Have Not Yet Met (APD Press, 2008). Her poems have appeared in numerous literary journals includingSalmagundi, Slipstream, Beloit Poetry Journal, and Blueline. Her artwork has been widely exhibited throughout the Northeast and is held in private and public collections.